Happy Leap Day! We find it fitting that while we are celebrating a day that only comes around every four years, we take this time to provide the Shor-Line Community a sneak peek into a new product that leaps into new industry territory. We are proud to introduce Shor-Connect for all Shor-Line scales. This is industry changing! Utilizing wireless technology you can now see a patient's weight instantly from many feet away on a PC or a remote display. When entering a hospital one of the first things a patient and their owner are asked to do is step on the scale. Now the patient can step on the scale while the technician or office assistant can click on the scale readout on their PC or view on a remote display and the weight is recorded right there. No wires, accurate, and located where you want it. Shor-Connect can be added to any scale product currently offered (excluding the feline scale) by Shor-Line and comes in two options. A PC Viewer Remote Display Kit that retails for $249 or the D320 Remote Display Kit that retails for $499. The PC viewer is equipped with all the features necessary for accurate weighing. Zero, Recall, Free/Lock, Manual/Auto and LB/KG. You can easily toggle between Manual and Auto modes as well as Pounds and Kilograms. Holding the weight is also done by the click of the mouse (or button). If you desire the Remote Display you can mount the display to any wall desired and use the display as you would a typical Shor-Line scale display. The PC Viewer Remote Display offers you the flexibility of using a PC versus mounting a physical display to a wall. 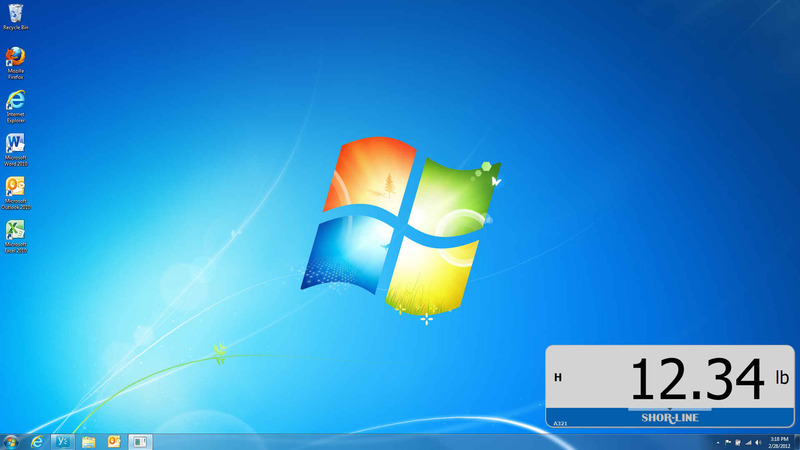 The PC display operates on Windows 7 and Windows XP platforms. Multiple applications of the Shor-Connect Viewer are only supported on Windows 7. The software is easy to install on your PC. The PC requires a USB Dongle for operation. Shor-Connect will be available soon. Be sure to ask your Shor-Line Representative for more details of this industry changing product!